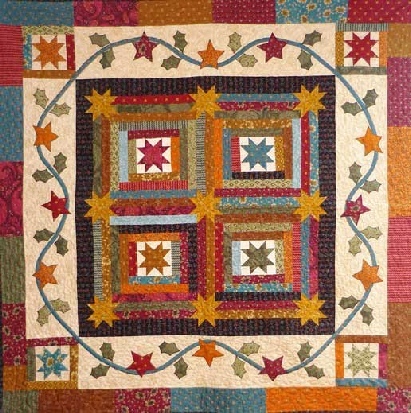 Beautiful quilt using The Hearthside Seasons range of fabric by Kim Diehl. 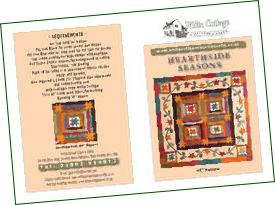 The design is based on a free download pattern from Kim but adapted and changed to suit White Cottage. She is the only designer that I order the full range of fabric from as she does use all fabrics from her ranges in her designs, which is what gives them their richness. 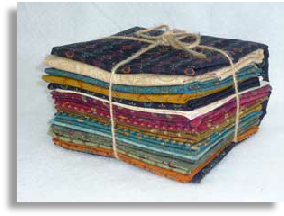 Includes - Pattern, 19 Fat 1/8m, 2 Fat 1/16ths Creams, Fat 1/4m each of Gold (stars), Black (border & blocks) and Blue Star (vine), 3/4m Cream Paisley (wide border), 1/2m Binding. PATTERN - FREE with kit.